Q: An Evilswarm Thanatos whose effect was applied this turn and a Yubel are face-up in my Monster Zone. In this situation, when the effect of Yubel activates during my End Phase, how can I resolve its effect? A: When resolving the effect of Yubel during your End Phase, you must either Tribute another monster on your field or destroy that Yubel. In this scenario, Evilswarm Thanatos is unaffected by other monsters’ effects and cannot be Tributed, so you must destroy Yubel. Q: A Harpie Channeler on my field had a Predator Counter placed on it by the effect of Predaplast, and its current Level is 1. In this situation, if I Summon Harpie’s Pet Dragon, will Harpie Channeler become Level 7 by its own effect? Q: When my opponent activates the effect of Drochshúile the Spirit King when a Zombie-Type monster’s effect is activated, can I chain the effect of Ghost Belle & Haunted Mansion? A: You can chain the effect of Ghost Belle & Haunted Mansion to the effect of your opponent’s Drochshúile the Spirit King. Furthermore, it does not matter if your opponent has already applied the effect of banishing from the Graveyard that turn. Q: I activate the effect of Drochshúile the Spirit King when a Zombie-Type monster’s effect is activated, and my opponent chains Imperial Iron Wall. This turn, I have already applied the effect of Drochshúile the Spirit King that negates the effect of the Zombie-Type monster it chained to. Later this turn, if Imperial Iron Wall is destroyed and I activate the effect of Drochshúile the Spirit King again, can I choose the effect that banishes a card? A: When you activate the effect of Drochshúile the Spirit King that chains to a Zombie-Type monster’s effect, you choose which “●” effect to apply when the effect resolves. Since cards cannot be banished while the effect of Imperial Iron Wall is applying, you cannot choose the effect that banishes a card in this scenario. In that case, the effect that banishes a card is not treated as having been applied that turn, so if the effect of Imperial Iron Wall stops applying and you use the effect of Drochshúile the Spirit King again, you can choose to banish a card on the field or in the Graveyard. Q: While Zombie World is face-up in my Field Zone, I activate the effect of Drochshúile the Spirit King during the Standby Phase that Special Summons it from the Graveyard. If my opponent chains Cosmic Cyclone and banishes Zombie World, how does the effect of Drochshúile the Spirit King resolve? A: In this scenario, even if there are no face-up Field Spell Cards on the field when the effect of Drochshúile the Spirit King resolves, it is Special Summoned from the Graveyard normally. Q: Otherworldly Banshee is face-up in my Monster Zone, and its effect that prevents players from targeting Zombie World in the Field Zone with card effects is applying. In this situation, if I activate Zombie World from my hand, can my opponent chain Mystical Space Typhoon and target it? A: In this scenario, the effect of Otherworldly Banshee applies to copies of Zombie World being activated from your hand to the Field Zone. Therefore, Mystical Space Typhoon cannot target Zombie World when chained to its activation. Q: I activate the effect of Zombie Necronize that Sets it from my Graveyard. If my opponent chains Call of the Haunted and Special Summons Dark Simorgh, how does the effect of Zombie Necronize resolve? A: In this scenario, the effect of Zombie Necronize resolves while the effect of your opponent’s Dark Simorgh that prevents you from Setting cards is applying. The part of the effect that shuffles a banished Zombie-Type monster into the Deck is applied normally, Zombie Necronize cannot be Set and remains in the Graveyard. Also, if the effect of your opponent’s Dark Simorgh is already applying, you cannot activate the effect of a Zombie Necronize in your Graveyard. Q: Vampire Fraulein is face-up in my opponent’s Monster Zone, and the only monster in their Graveyard is Vampire Sucker. Also, Drochshúile the Spirit King is face-up in my Monster Zone, and the only monster in my Graveyard is Mezuki. In this situation, if I activate Return of Zombie, how can I resolve its effect? A: Since the effect of Return of Zombie cannot Special Summon a Link Monster from the Graveyard, you cannot banish a Zombie-Type monster controlled by a player whose only Zombie-Type monster in the Graveyard is a Link Monster. In this scenario, you can activate Return of Zombie, but you cannot banish Vampire Fraulein, so you must banish Drochshúile the Spirit King and Special Summon Mezuki from your Graveyard. Q: My Red-Eyes Zombie Necro Dragon and my opponent’s Zombie-Type monster with the same ATK battle, and both are destroyed. In this situation, can I activate the effect of Red-Eyes Zombie Necro Dragon? A: In this scenario, if Red-Eyes Zombie Necro Dragon battles a Zombie-Type monster with the same ATK and both monsters are destroyed, you cannot activate its effect. Q: There are 3 Hippo Tokens on my opponent’s field. In this situation, if I attack a Hippo Token with Timelord Progenitor Vulgate, can I activate its effect at the end of the Damage Step that banishes all monsters on my opponent’s field? A: In this scenario, even if the only monsters on your opponent’s field are Tokens, you can activate the effect of Timelord Progenitor Vulgate. As a result, the Tokens disappear when they leave the field, but the effect that halves battle damage your opponent takes this turn is still applied. 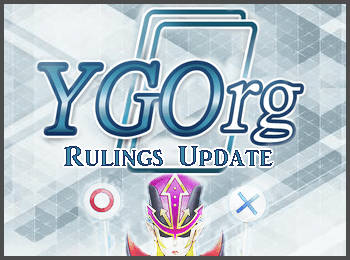 During the End Phase of this turn, the effect of Timelord Progenitor Vulgate that Special Summons the monsters banished by its effect will activate and start a Chain, but the Tokens are not Special Summoned to your opponent’s field. Q: I activate the effect of Timelord Progenitor Vulgate at the end of the Damage Step and banish my opponent’s Odd-Eyes Phantom Dragon. During my Main Phase 2, if I activate De-Synchro and return Timelord Progenitor Vulgate to the Extra Deck, will its effect that Special Summons the monsters banished by its effect activate during the End Phase? Q: I activate the effect of Timelord Progenitor Vulgate at the end of the Damage Step and banish my opponent’s Odd-Eyes Phantom Dragon. During my Main Phase 2, if I activate Book of Moon and change Timelord Progenitor Vulgate to face-down Defense Position, will its effect that Special Summons the monsters banished by its effect activate during the End Phase? A: In this scenario, if Timelord Progenitor Vulgate is changed to face-down Defense Position after its effect is used at the end of the Damage Step, its effect that Special Summons the banished monsters during the End Phase will not activate. (In this case, your opponent’s Odd-Eyes Phantom Dragon remains banished.) Also note that even if Timelord Progenitor Vulgate is flipped face-up by an effect such as Ceasefire before the End Phase, its effect will still not activate. Q: I activate the effect of Timelord Progenitor Vulgate at the end of the Damage Step and banish my opponent’s Odd-Eyes Phantom Dragon. During my Main Phase 2, if my opponent activates Enemy Controller and takes control of Timelord Progenitor Vulgate, will its effect that Special Summons the monsters banished by its effect activate during the End Phase?